Alana believed the swelling and mild pain in her face would alleviate with a dose of children allergy medication. But, after a few minutes, the swelling had gotten worse, specifically around her eyes. Eva could barely see a few feet in front of her where her mother had been standing. As tears ran down Eva’s face, Alana took Eva’s hand, and promised her that everything would be OK. Alana picked up her daughter, put her in the back seat of her car, and rushed her to the urgent care facility nearby her house. Alana gave Eva the prescribed allergy medication and waited for the swelling to go down. Alana thought she had the situation under control, and that she would simply stop taking Eva to her favorite Japanese restaurant. Sadly, Alana’s instincts had been correct. Testing revealed that Eva’s kidneys were failing. As a matter of fact, only 4 percent of her kidneys were functioning at the time. The medical team told Alana if she hadn’t brought Eva in, she likely could have died within the next few days. After several long and difficult months of scans and surgeries at the hospital, doctors diagnosed Eva with collapsing focal segmental glomerulosclerosis. This rare disease doesn’t respond to therapy, and leads to symptoms like high blood pressure, hypertension, edema and swelling in the legs, and, eventually, renal failure. Eva was in desperate need of a kidney transplant, but finding a viable candidate proved to be much more difficult than Alana imagined. Though many relatives were ready to donate to help little Eva, none were a match. Alana has helped set Eva up to a dialysis machine at home every night for sessions that usually last 10 hours at a time. It is a process that is mentally and physically draining to Eva’s fragile body, but necessary until the day a transplant comes in. In addition to this painful process, Eva had to take 20 to 30 pills a day. Shortly after Eva’s diagnosis, the family set up a YouCaring donation page to raise funds for medical expenses, bills and supplies. As a single mother, financial woes had been nothing out of the ordinary in Alana’s life, but remaining out of work for months at a time while caring for her daughter, had forced Alana to deplete all the money she had in her savings. Alana Brown was forced to sell her home and valuables to help pay for the mounting hospital bills. Without a home, Alana was forced to live with different relatives while Eva stayed at the hospital for round the clock medical care. But, Alana was not concerned with her own life struggles, her one and only goal was finding a donor for her little girl. With the weeks passing and Eva’s health deteriorating, the need for a donor had become increasingly urgent. 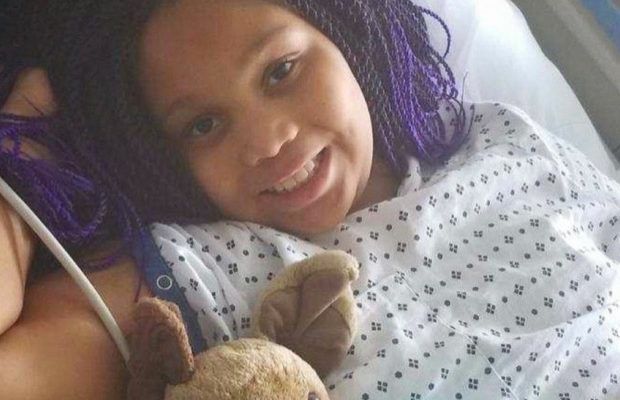 A friend of Alana’s took to Facebook to ask if anyone would be willing to donate, and dozens of people responded, but one person stood out in particular, a stranger named Tanya Thomas. Alana hadn’t realized the woman working to save her daughter’s life wasn’t much of a stranger after all: Tanya is a teacher at Slate Ridge Elementary, where Eva is a student. They barely knew each other before, but Tanya remembers Eva’s vivacious personality and beaming smile in the hallways. After Eva started missing school last due to her failing kidneys, Tanya jumped in without hesitation. An invasive, six month long screening process determined she was a perfect match. Doctors were saying there’s less than a three percent chance for rejection. Although, the transplant is currently put on hold until doctors are successful in stabilizing Eva’s health issues, both Alana and Tanya are taking this time to spread the word out about the importance of organ donation. They want to encourage people to be living donors. Alana says Tanya and Eva hope their story inspires others to become living donors so that other lives can be saved.